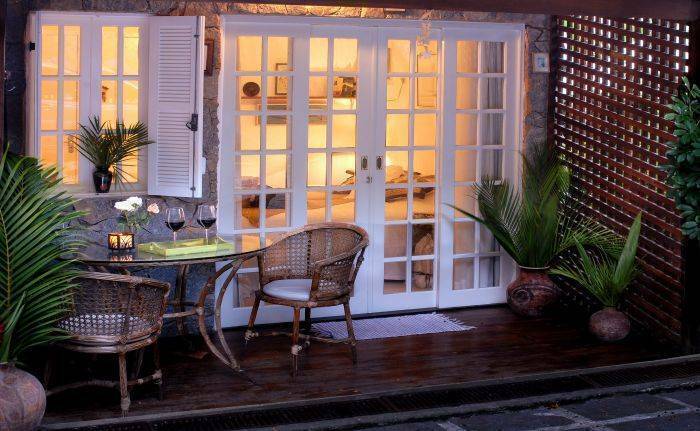 Angra Dos Reis Boutique Hotel offers sophisticated suites beautifully decorated, swimming-pool with bar, a restaurant with excellent homedae Brazilian cusine open from 8:00 to 22:00hs, and private deck for boats. Each suite has its special characteristic and decorations. All of them include private bathroom, air conditioner, cable TV, fridge and balcony. 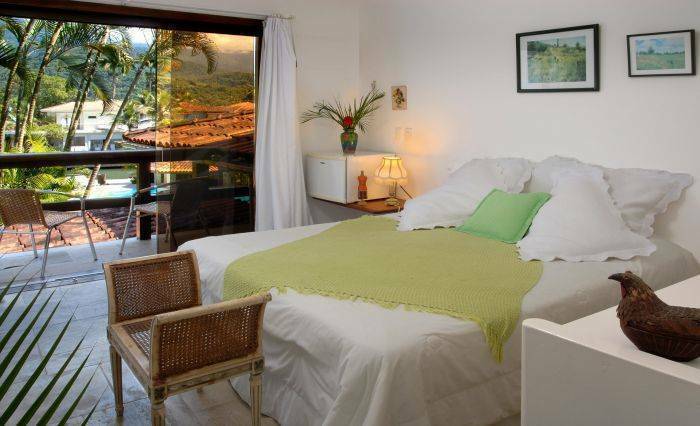 The Boutique Hotel is located in a true ecological paradise, which offers beauty and peace, situated in a private condominium with 170 million square meters and just a few minutes away from Angra dos Reis downtown. The condominium has many sports facilities, trails to waterfalls, marina, stores and a private beach. 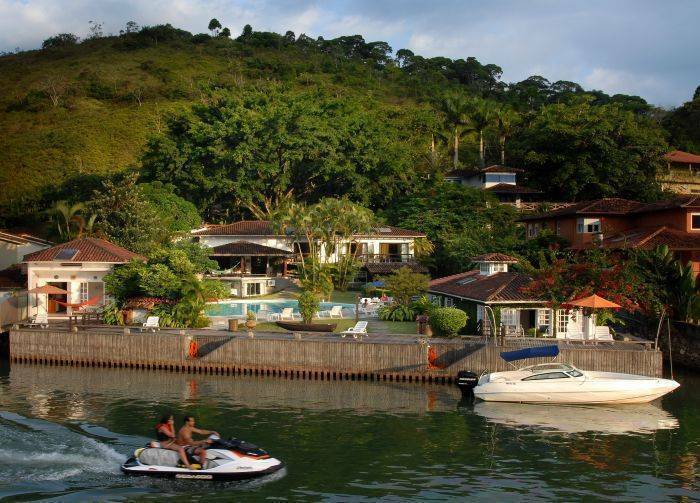 Among our distinguished and personalized services, we offer boat tours to the islands (extra charge) as well as shuttle from/to Rio city or airports (extra charge). Wi-Fi and parking are available at no additional cost. Delluxe Beautiful suite with front view balcony, equipped with King or Queen size bed, large bathroom, air conditioner, cable TV and mini fridge. Nicely decorated. Delluxe Plus Spacious suite with balcony. 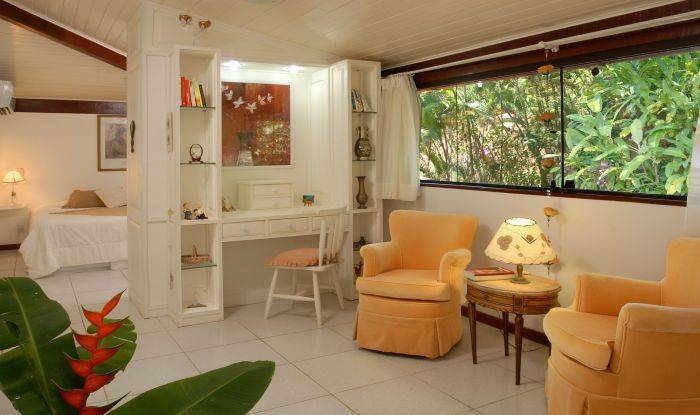 Cozy decoration, Equipped with king size bed, private bathroom, air conditioner, cable TV and mini fridge. Triple rooms include sofa bed. A good option for families! Glamour Two types of room under this category, one with a private deck and solarium and the other a spacious suite with classy decoration. Both equipped with King size bed, sofa, LCD cable TV, air conditioner and fridge. Perfect for couples! Presidential Loft style suite by the water with private deck for boats, solarium, state of the art decoration, enormous bathroom, king size bed, sofa, LCD cable TV, air conditioner, fridge and two independent entrances. Our largest and most charming suite! To reserve: 1st night deposit. Cancellations until 7 days prior to check in: full refund. Between 7 and 3 days prior to check in: 20% fine from the reservation's total. Less than 3 days prior to check in: no cancelation allowed and full charge of the reservation. 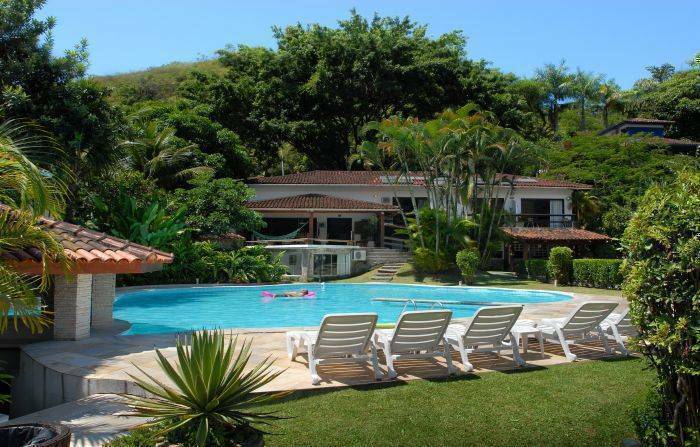 Get into “BR 101 Rio-Santos” highway and drive until you reach “Condominio do Frade” [in Km 509. 5, right next to an "Ale" gas station]. At the entrance, please ask the guard how to reach the Hotel (Rúa do Bosque J3), we are approximately 800 meters away from the security post. From Rio de Janeiro take the bus in "Novorio" station direction to Rio-Paraty, operated by "Costa Verde" company. Get off at “Condominio do Frade” stop. If you send us your journey details, we’ll make our best to meet you at the bus stop and take you to the hotel. We offer in & out transfer service from Rio de Janeiro airports and downtown. Please, contact us to hire this service.